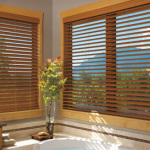 You are here: Home / Window Treatments / What are the Best Window Coverings for Bathrooms? 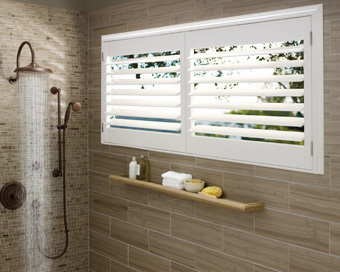 In the bathroom more than any other room, window coverings need to meet three requirements: privacy, durability, and light control. 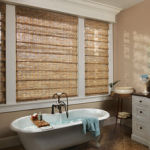 While most all window treatments do this to some degree, there are a few that work best in your bathroom. 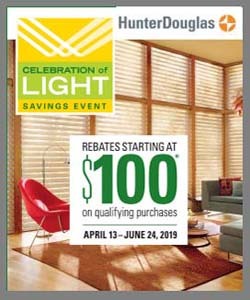 As your local Hunter Douglas gallery dealer serving the Novi area, we can help you find a window treatment that is perfect for your bathroom. 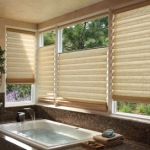 Roman shades maintain privacy, control light, and add a touch of softness to the space. 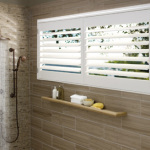 With a wide variety of colors and patterns available, you’re sure to find one that works well with the design theme of your bathroom. 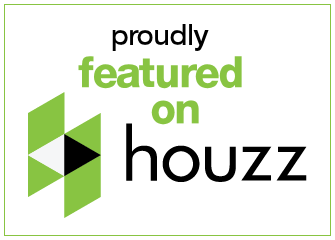 When considering fabrics, be sure to select one that is resistant to mildew and can be easily cleaned. 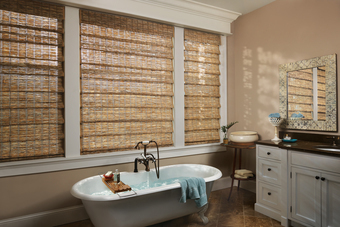 Custom curtains and top treatments work very well in a bathroom. Cafe curtains are made of lightweight fabrics that let in light while still offering modest privacy. 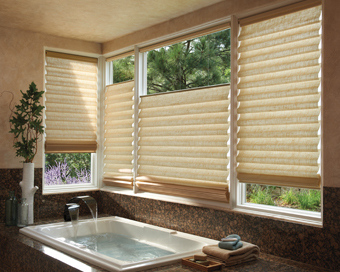 Custom fabric window toppers add a splash of color to your bathroom windows. 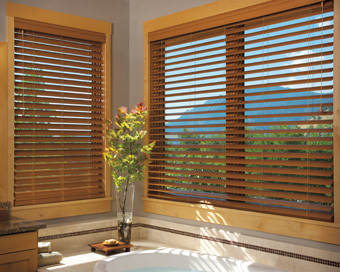 Add a valance above your blinds or shades, for example, to bring in an accent color or accentuate a theme. Incandescent Vs LED—Making the Change Is Easier Than You Think!